Slow Cooker Beef Burgundy – a hearty stew of beef and vegetables simmered in a red wine sauce, perfect for a cozy meal on a crisp fall day. 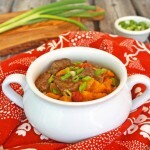 Sometimes there is nothing better than a comforting bowl of some good beef stew. 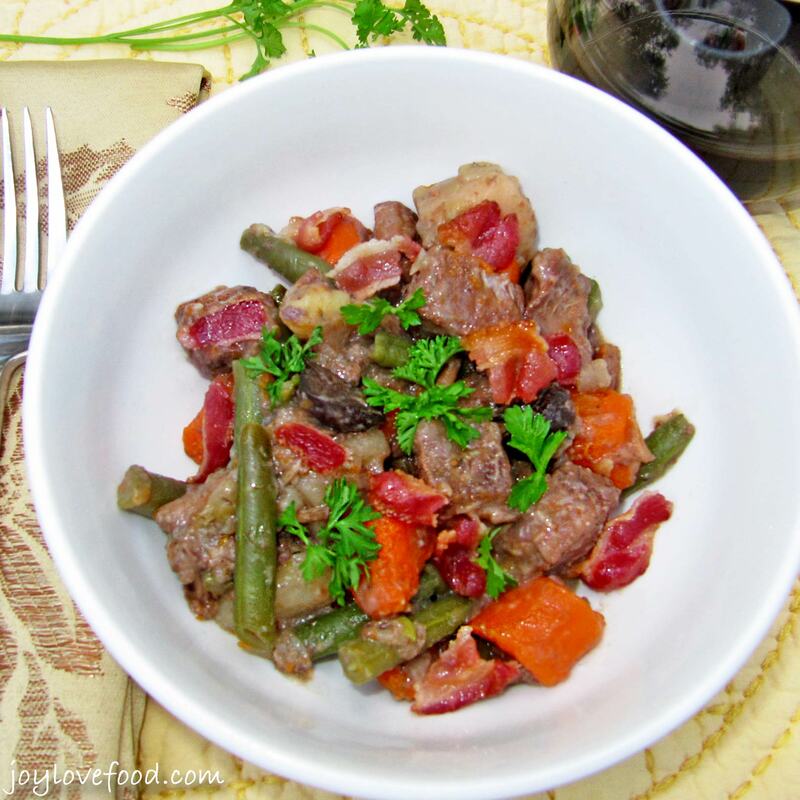 This Slow Cooker Beef Burgundy is one of my favorites. I first heard about the original version of this recipe about 5 years ago on the NPR radio program The Splendid Table with Lynne Rossetto Kasper. Lynne has this gift of describing food in such a way that you instantly start craving it. I did have to wait until I got back home from our visit. Luckily, I had recently acquired my very first slow cooker, so I could make this dish. It was so good, especially with the addition of crumbled, crisp bacon on top. This past weekend, I made a batch of this delicious Slow Cooker Beef Burgundy. Here in Massachusetts, we were having some of that gorgeous fall weather where it still feels like summer, at least when the sun is out. On Sunday, we spent the day at Castle Island in South Boston. We picked up lunch at a little seafood shack, and sat at a picnic table overlooking the water. The kids ran around the playground and we took a long walk along the water and watched the boats come in and out of the harbor and the airplanes take off and land at the airport. It was a fun, tiring day. So, I was happy to have this Slow Cooker Beef Burgundy to come home to for dinner. I had actually made it the day before, but this is one of those stews that gets better the longer they sit, so we were happy to have the leftovers again for dinner that night. 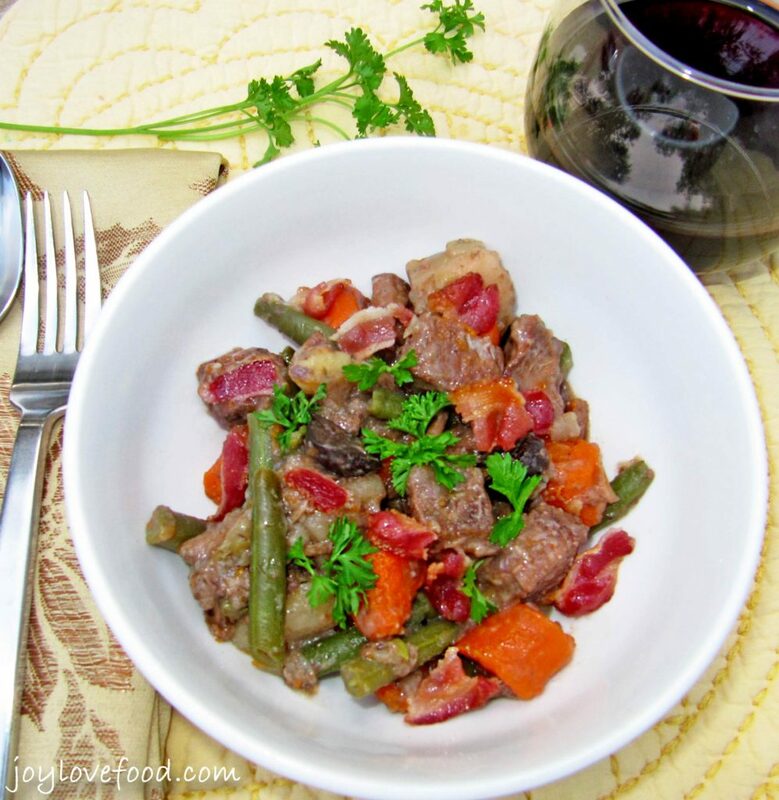 I love all the veggies in this stew — green beans, carrots, petite onions and baby bella mushrooms. Along with the beef and potatoes, and the bacon sprinkled on top, it is a delicious one pot meal. Trim excess fat from beef and cut into 1-inch cubes. In a 6-quart slow cooker, combine the cubes of beef, flour, salt and pepper and toss to combine. Add the potatoes, onions, carrots, mushrooms and thyme to the slow cooker. Pour the wine over the mixture in the slow cooker. Cover and cook on low heat for 6 to 8 hours or until beef and vegetables are tender. Stir in the green beans, cover and cook on low for an additional 20-30 minutes or until beans are heated through. Serve and top with chopped bacon and fresh parsley if desired. 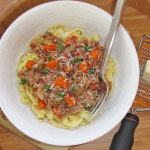 Adapted from Slow & Easy Fast-Fix Recipes for Your Electric Slow Cooker by Natalie Haughton. 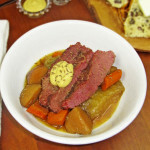 This entry was posted in Crock Pot / Slow Cooker, Main Dishes and tagged beef burgundy, beef stew, carrots, green beans, one pot meal, potatoes, slow cooker. I love the colors of it! I am big on colorful food lol. I dont really know why, but its more fun to eat when you get to look at pretty colors going onto your fork! 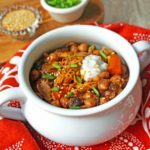 Thanks for linking up this week…pinned this for dinner next week! Party starts at 10 tonight! Cant wait to see what you did this week! Thanks Jessica, I will definitely be back at your party! oH Yummmmm This looks so elegant even. Thanks for sharing, and in the slow cooker? Wow, that’s just to easy! Thanks for stopping by too. I posted way late so no one stopped by. So thanks so much. I hope to see you next Friday too! 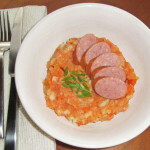 I have a Recipe linky every Friday. This is great! Have a great weekend. XmasDolly recently posted…BIG HERO 6 is now playing in theaters Everywhere! This looks so delicious! I love any recipe that can take an inexpensive cut of meat and make it awesome. I’ll be adding to next week’s meal plan! Thanks for sharing on Totally Terrific Tuesday! Thanks Olivia! 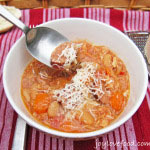 I love my slow cooker and the wonderful meals that come out of it with minimal effort! Thanks for coming by! Your meal looks wonderful, I love slow cooking!!! Thanks for linking up this week!!! Thanks Karren! Thanks for stopping by! Thanks KC, hope you give it a try and enjoy! I’ll definitely be back at #theWeekendSocial! Fall is the perfect time to make a recipe like this. I can’t wait to try this one. I just have to wait for cooler weather. We’ve still been hitting temps of 96+Fall can’t come soon enough! Please feel free to share your recipes at my weekly parties if you like. Have a great week Joy! Wow! 96 degrees in October, unheard of here in New England. Hope you give this one a try when temps cool down in CA and enjoy! Your meals always look so colorful and tasty, Joy. I will have to try this – I got a big old gallon of cooking wine sitting in my kitchen! !